Upon arrival in Fiji we encountered two problems. First, five bags never made it. I called my wife Austen back in Boston and she worked the phones with the airlines until the bags were located and they guaranteed to her would be on the next flight to Fiji in time for our departure, so that problem solved. Next, the other 14 bags that did arrive with us were impounded by Fijian customs because they suspected it was commercial equipment to be used in Fiji for business. They wanted to charge us thousands of dollars in duty. So Brian, Larry Madin and I spent the morning in meetings with the head of Fijian Customs at Nadi and finally found a solution: they would keep our gear and then transfer it directly to NAI'A the next day, thus ensuring that it was not destined to be sold or otherwise used in Fiji. Fiji is only a transit point for us, the closest major airport to our remote destination, as we slowly make our way across the planet to the Phoenix Islands Marine Protected Area (PIPA), the largest marine protected area in the world. We are now at sea, having loaded the vessel and gathered most of the people. Unfortunately, one member, Jim Maragos, missed his plane to Fiji and we had to leave without him. 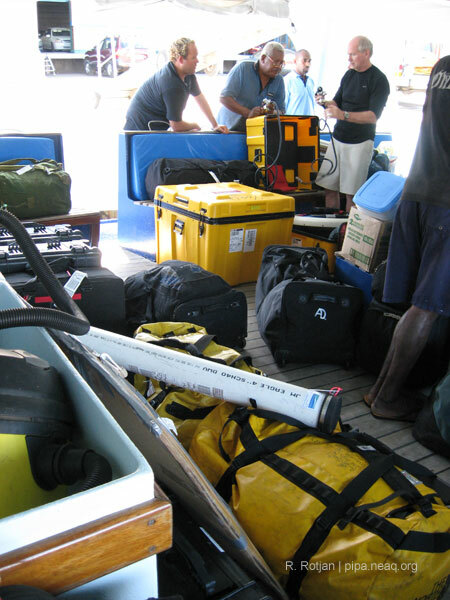 The first day on an expedition like this is consumed with sorting gear and settling in. The ship was a beehive of activity. HD camera gear there, microscope here, plankton net stored under that, diving gear up there, and where do we store the liquid nitrogen canister? The list was endless. One very unusual item was the hyperbaric chamber. Because we are going to such a remote place we have brought our own hyperbaric chamber, which will allow us to re-compress a diver should they spend too much time underwater and suffer from decompression sickness. After sorting gear, we also had our first team meeting before dinner--each of us explained our objectives for the expedition. Tukabu Teroroko, the director of the PIPA gave a stirring speech about the importance of PIPA to the country of Kiribati and the value of our research expedition to monitoring and evaluating the effectiveness of PIPA. Very importantly, PIPA has been nominated to UNESCO as a world heritage site for its natural and cultural values*. Our trip will help support if the nomination. Now, it is early morning, the day after departure, and I am in the ship's salon writing this. The diesel engine of NAI'A hums in the background and everything is gently rocking back and forth. We are still under the protection of the Fijian Islands; we have another 12 hours before we get into the open ocean where waters will be rougher. 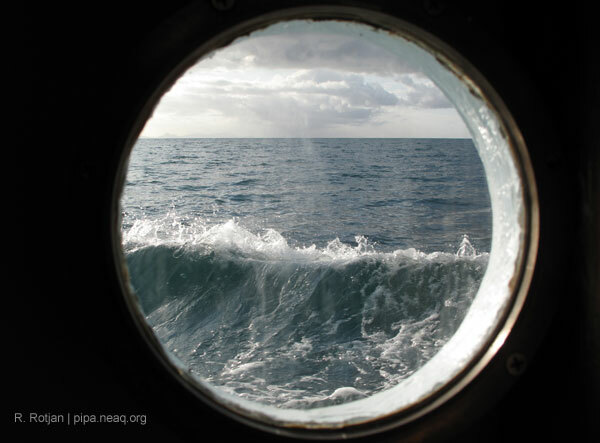 So we settle in for a four-day trip to PIPA continuing to prepare gear, continuing our endless discussion about PIPA's fish, sea jellies, coral, tuna and continue to hope that the open ocean portion of our journey, which begins in about 12 hours will not be too rough. *PIPA has since been named a world heritage site! Learn more here.